The Quickplay Kickster Academy Portable Football Goal 16ft x 7ft is the only football goal that is truly portable and both quick and easy to set up. Kickster goals can be ready for play in just a couple of minutes, with no instructions needed, as all of the poles are connected with elastic. Small pack size and lightweight - 1/2 the size and weight of other portable goals on the market. Simple and quick to assemble in just a couple of minutes. All poles are pre-attached with elastic cord (just like a tent!). Making it easy for anyone to assemble and reduces loss of parts. Kickster goals can be easily carried by children and are small enough to pack into a family car to go on holiday, to the park or anywhere. Designed and manufactured by Quick Play Sport and tested to BS EN 71. Complete with carry bag and ground pegs. Assembled size - L 488cm x H 213cm x D 110cm (16` x 7`). Packed size - 15cm x 22cm x 123cm. I have bought 2 x 9 v 9 goals and 1 set of 7 v 7 goals. All are very easy to set up and use. My goalkeepers love them. I wish i had bought them sooner. We purchased 2 of these quickplay goals as we wanted to have a proper goal rather than use 2 slalom poles. These goals give our lads a realistic target and are strong, sturdy and have taken everything the boys have kicked at them. I shopped around and once again Newitts came up cheapest and with reliable service and quick delivery we are more than happy. Great product for summer training! Most of our midi and youth soccer teams have a set of these goals from Newitts to train over the summer. Easy to use and durable. Need to be looked after to ensure they last but that's the same with anything. Great price and good product. Bought for training u15s, these goals have proven to be a great success. Easy to erect and put away, they provide a suitably sized target for the age group, but don't take up the garage space for the rest of the week when stored away. Easy to put up, lightweight and kids love it. It's huge for my 10 year old but he thinks it's great and it's good practice for anyone in goals! 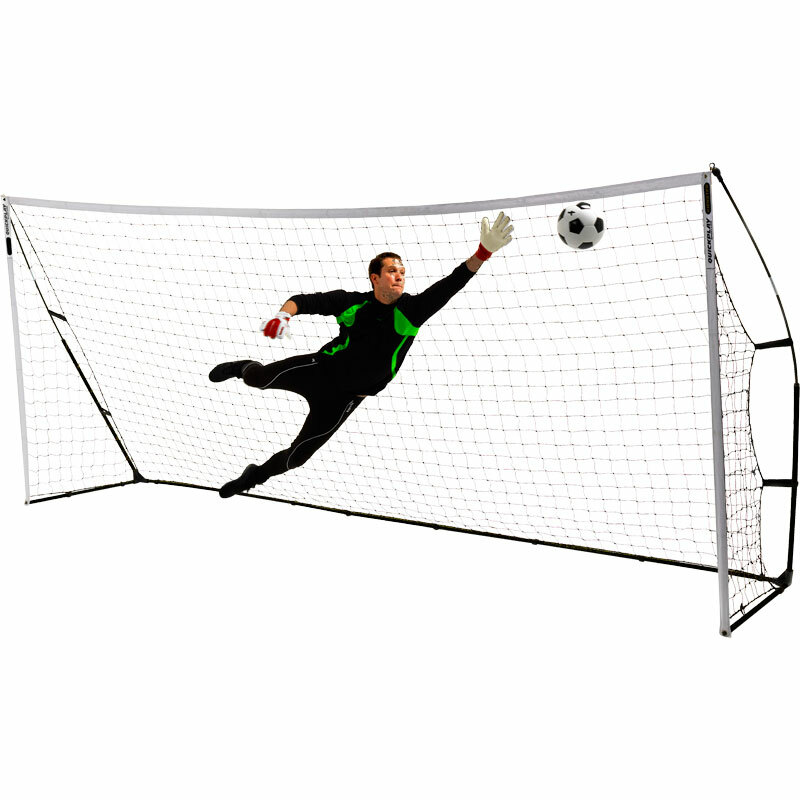 I have purchased several sets of these goals for our youth club teams and they are great for keeper training and mini matches to close a training Session. As it says on the box they are simple to put up and quick to take down. Good strong storage bag and not to heavy to transport to the training ground. I'm so glad we ordered a pair of these goals for our u14's team. We have used these for a couple of training sessions now and have been well received! They are so quick to put up and due to there flexible nature, the nets don't break like they do on solid framed goals that have no 'give'. They also take up hardly any room, with both fitting in my boot along with the ball and kit bag, first aid kits etc etc! Would highly recommend! The Quickplay Kickster Academy goal is perfect for my U11 team easy to set up and take down, I haven't had any issue's with the net getting tangled but have found if you pack the net first before the pole's it does make packing away easier. Quickplay Kickster Academy 16ft Portable Football Goal Post is of excellent quality and it is easily assembled - Highly recommended. I purchased two of these goals to use in our training sessions over the summer. They arrived very quickly however one of the goals had a few quality issues which meant it did not clip together properly. Newitts were fairly quick to send a replacement piece. The replacement also had a small issue that I ended up fixing myself. It wasn't broken as such just needed a bit of tweaking to get it all working. The design of the goals is good and they are pretty quick to put up (about 4-5 mins) I'm not sure how long they will last but if you take care of them they should be OK. The ground pegs that come with the goal are not tough enough for the hard ground we have at the moment and bend fairly easily. Hammering in at a 45 degree angle does tend to make it easier. One tip I would give is to be very careful putting the net away after first use. Make sure you fold it carefully and don't just chuck it in the bag. It seems to want to get itself in a knot very easily. I let the kids do it and paid the price next time we used it. Basically it wasn't possible to unpick the knot on the pitch. It took and hour of very patient work indoors out of the wind to get it back to normal. The goals have stood up well to normal use from u16s players for 5 sessions so far. The only breakage has been one of the small plastic clips that hold the net in place. Easy to carry and set up - now training on grass so with posts taken down the Kickster goals are great to use to end the session with a match. We bought these goals for our coaching sessions with boys and girls aged 12 -14, and I have to say they are perfect! They are really easy to set up and put away, and are pretty robust too. They are excellent to give focus and a realistic target for our sessions, when a usual goal is not available. We'll see how they stand the test of time but so far so good, I would recommend these goals. 5 out of 5 Outstanding! Great price.... excellent quality... superb delivery. Couldn't ask for more. This goal is easy to set up & is very well made to cope with enthusiastic footy action.